Designed based on the experiences of Vietnam, the F-14 was to replace the F-4 as the main fleet interceptor. Based on that premise, it was pretty much built around the Phoenix missile system that was originally to go into the F-111B, an aircraft that proved to be too large for carrier operations. The time between the failure of the F-111B and the Tomcat allowed the makers of the Phoenix to work out all the system glitches and provide the Navy with a pretty much ready to go weapon. As swing-wings were still the rage, the Tomcat had those. Though this system added a bit of extra weight, it allowed the plane to be quite docile when it came to carrier landings and also allowed a longer cruise range with the wings extended. Sweep them back and it became quite fast. Automatic systems allowed the wing sweep, which was infinitely variable, unlike the MiGs, to change during maneuvers, giving the F-14 outstanding dog-fighting capabilities. Originally saddled with the less than optimal TF-41 engine as used in the F-111, after many years of service, the aircraft finally got decent engines in the F-14Aplus/F-14B version. Even more improvements were made that resulted in the F-14D. However, politicians were unwilling to fund the needed airframes and so few new build D models were built. In fact, half the F-14D fleet were rebuilt F-14A airframes, referred to as F-14Dr. Eventually, the Tomcat was removed from service to be replaced by the less capable, but newer F-18F. Due to unwarranted fears of Tomcat parts ending up in the hands of Iran, the only other nation to get the F-14, once the plane was pulled from service and those museums that wanted one had one, all airframes and any extant spares they could find were destroyed. When the box is opened, one sees the usual high quality Hobby Boss engraved detailing on this one. The upper and lower fuselage sections are segregated behind a cardboard shield to keep damage during shipping at a minimum. Looking over the parts, I was reminded that there are only so many ways to design a Tomcat kit. 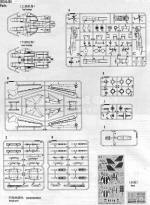 The parts are so very familiar to what you would see if you opened an F-14 kit from Revell or Hasegawa, or Italeri. The kit has the main fuselage split horizontally with the cockpit area split vertically. The wings have gearing on the inside that meshes to allow the wings to be posed swung back or fully extended. Flaps and slats are molded in the neutral position. The ducktail and seeker are separate to take into consideration other versions. There is no insert on the left forward fuselage for differences in the gun and vents so to do other versions, new forward fuselage sections will be required. The cockpit includes the usual instrument panels and control sticks. 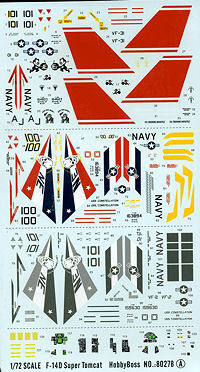 A set of decals are available for the instrument panels and side consoles. A set of convincing looking bang seats are provided, though pretty basic and might be best replaced by more highly detailed resin seats. Windscreen and canopy are separate items, but there is no apparent option to have this open. At the back, one has the option of fully open or fully closed burner cans. If you recall from a previous Tomcat build, it was quite common to find one open and one closed. Now we come to the weapons options. Of course, one can opt for a full Phoenix load with the installation of the fuselage pallets and glove pylons. One can also opt for a pair of Sparrows and SIdewinders for the wing pylons. No bomb racks are included, though the Tomcat spent its last decade with air to ground capabilities and in fact spent most of the opening stages of the Afghan war doing bombing missions. A pair of drop tanks is also included and were worn most of the time. Instructions are very well done and provide colors from a variety of makers. Markings are three options, all of them in the TPS camouflage scheme so hope you do not mind greys. One is the box art plane which is a line bird from VF-2. This one is an F-14Dr. Next is a CAG bird, also from VF-2 with a lot of color and an impressive mission tally behind the nose stripes. The third is the CO's plane from VF-31 in a scheme that is reminiscent of when the unit first formed on the type with a black nose and lots of red on the fins. The cockpit area is in black. I found it interesting that the markings placement guide shows the refueling probe out, an option that is not provided with the kit. 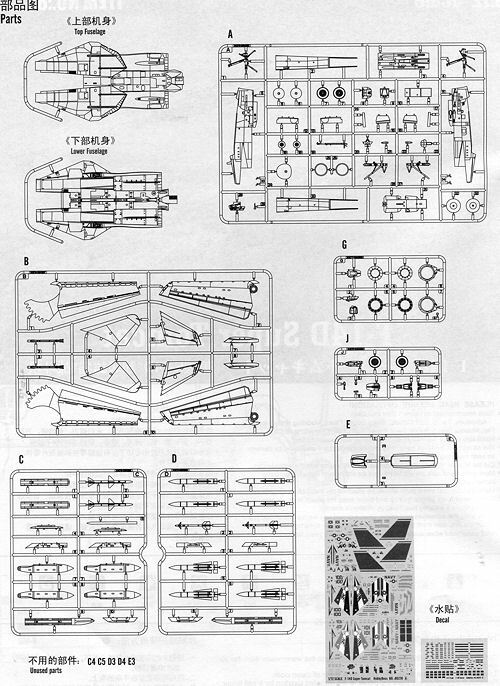 Another smaller sheet that is not shown includes markings for the missiles. The decals themselves are very nicely done and as most of you know Hobby Boss decals work very well. 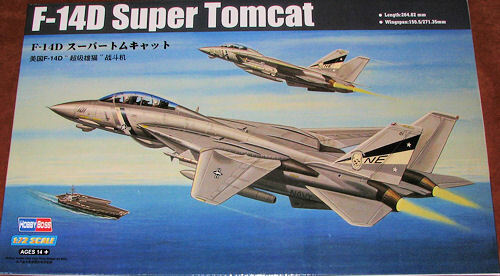 Now we have yet another option for 1/72 Tomcats. This is a nice one and has a couple of benefits over the king of the crowd, the Hasegawa kit. One is that it is not a fiddly build. No mass of inserts. The other is that it comes with a full weapons load so no need to purchase a weapons set to do a fully loaded version. If you are an F-14 fan and want to do the last variant, then you should seriously consider this one. Thanks to Squadron Products for the preview kit. You can get yours at your local hobby shop or on-line retailer.